Shop hours: Tuesday through Saturday 10 a.m. to 4 p.m. Donations received 10 a.m. to 3 p.m. Thanks to our many wonderful customers, members, and community folk, we have tons of wonderful ‘new’ items on display. Stockton is a wonderful community with many caring, generous people; we thank them all for their support. Sometimes donated items are not suitable for our retail space, but are well received by one of Stockton’s finest nonprofits: Cerebral Palsy Foundation of San joaquin County, and we are happy to have them come to take our donations that we can’t use. As a nonprofit organization, we may re-donate only to other 501(c)(3) organizations. 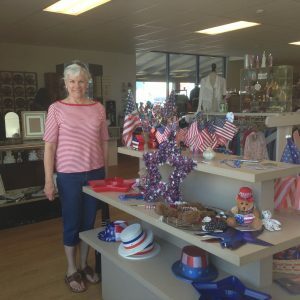 OUR CUSTOMERS LOVE OUR SHOP! Your donations are always appreciated! Donations are tax deductible, a receipt will be provided. Please bring your “gently used” items to the receiving door located at the rear of the thrift shop entrance. Ring the doorbell, wait, and we will assist you in dropping off your items. For safety reasons, donations are accepted only during the following hours: Monday: 11 AM-3 PM, Tuesday through Saturday: 10 AM – 3:00 PM. Please, do NOT leave items outside when we are closed, as they will be damaged by the weather. Assistance League of Stockton is an all volunteer organization dedicated to serving the community through philanthropic programs.